Pacifica, California's Natural Coastal Erosion and the Lust for Climate Catastrophes | Watts Up With That? For 25 years I’ve lived in the beautiful town of Pacifica, California situated about 15 miles south of San Francisco. It was a wonderful place to raise a family. Its great expanse of green space is a delight for an ecologist. My daily hikes vary from coastal bluffs to watch feeding Humpback Whales or migrating Gray Whales, to inland mountain trails with abundant deer, coyotes and bobcats. Oddly this past week I received emails from friends around the country asking if I was “all right”, thinking my little slice of heaven was falling into the sea. Not to disrespect their concern, I had to belly laugh. The news of a few houses, foolishly built on fragile land too near the sea bluffs’ edge, were indeed falling into the ocean and were now providing great photo-ops for news outlets around the world. See a video here. It is fascinating how such an isolated event covering 0.5% of the town of Pacifica would suggest to friends that the whole town was endangered. But like so many other alarmists, bd6951 blindly believes every unusual event must be due to rising CO2. Because the media rarely tries to educate the public about natural changes, paranoids like bd6951 perceive every weather event as supporting evidence for their doomsday beliefs, despite a mountain of evidence that it is all natural. Sadly when you try to educate them about documented natural change, paranoids feel you are “disarming them and exposing them to even greater dangers of rising CO2. But anyone familiar with Pacifica’s history understands this coastal erosion hotspot has nothing to do with global warming, and everything to do with the local geology and the natural El Nino oscillation. So let’s put California’s eroding coastline into both a long term and recent framework. About 72% of California’s coastline consists of steep mountains slopes or raised marine terraces that are being relentlessly chipped away by Pacific Ocean waves. However the geology of the coast is complex due to varied depositional events, colliding plate tectonics and earthquake faults. At one extreme are erosion-resistant metamorphosed submarine basalts, greenstones, formed over 100 million years ago during the age of dinosaurs, and often forming headlands that defy the battering waves. Similarly the granites of the Monterrey Peninsula endure with very little erosion. On the other extreme are unconsolidated sandstones that were deposited during the past 12,000 years of the Holocene. Due to vastly different resistances to erosion, California’s presents a majestically steep and undulating coastline. The Pacifica locale has eroded more rapidly because the sea cliffs consist mostly of weakly or moderately cemented marine sediments from the more recent Pleistocene and Holocene. And because Pacifica has long been known as a hot spot of coastal erosion, it has been studied for over 100 years. For a more detailed geology read a 2007 USGS report Processes of coastal bluff erosion in weakly lithified sands, Pacifica, California, USA . As always, before we can blame catastrophic CO2 climate change, we must understand the local setting and the effects of natural change. 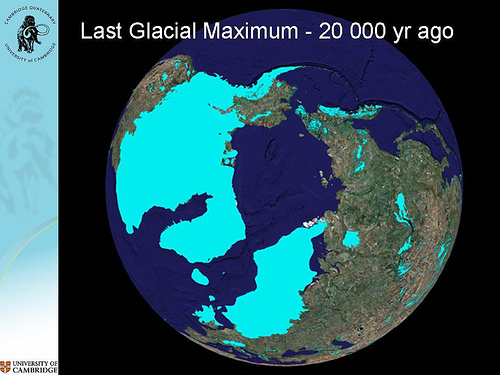 Since the end of the Last Glacial Maximum sea levels have risen about 120 meters. During the past 18,000 years most of California’s coast retreated 10 to 20 kilometers eastward at rates of 50 to 150 centimeters per year. The San Francisco/Pacifica region was much more susceptible to erosion and retreated about 50 km. After the Holocene Optimum ended about 5,000 years ago and sea level rise slowed, and California’s current rate of coastal erosion decreased to about 10 to 30 cm/year. Undoubtedly rising sea levels have driven coastal erosion. But based on San Francisco Bay Area’s sea level change posted at the PSMSL, since the end of the Little Ice Age this region has undergone a steady rise in sea level of less about 2 mm/year and counter-intuitively, the rate of sea level rise has slowed the past few decades as seen in the graph. Sea level rise varies most between El Nino and La Nina events. Assuming a 150-year rate of local coastal erosion of 30 cm/year, any structure built within 20 meters of the sea bluffs’ edge in 1950, was doomed to fall into the ocean by 2015. But homebuyers that were new to the region were typically naïve about the natural geology and climate. Fortunately when I was shopping for Pacifica homes in 1982, my background allowed me to recognize that developers had ignored all the signs of natural climate change. They unwisely built homes too near the cliffs’ edge to ensure a spectacular view, or they had built in the flood plains and filled tidal marshes. Awareness of the power of El Niño’s is critical. Sea cliffs crumble and flood plains flood during El Nino events. Indeed during the 1982 El Nino, Pacifica’s Linda Mar lowlands flooded as heavy precipitation filled the banks of San Pedro Creek and high tides resisted the creek’s flow to the ocean. Inspecting Linda Mar’s homes, we could still smell the dampness in every house located in those lowlands. Along the bluffs of Esplanade Drive we likewise saw a evidence of coastal retreat during the 1982 El Nino, but not enough to undermine homes and apartments. That did not happen until the El Nino of 1997/98. Wisely we bought our home further inland on a solid ridge. As seen in the picture below from a USGS report, homes in the Esplanade area still had backyards until the 1997/98 El Nino struck. Residents were well aware of the imminent threat as revealed by the boulders, or riprap, placed at the base of the crumbling cliffs to discourage erosion, but those remedies were no match for the ensuing El Nino storm surge. Unfortunately scientific measurements of coastal erosion did not begin until the 1960s led by Scripps Institute of Oceanography. So early developers had to guess how far back to set their homes from the bluffs’ edge. Due to recent research we now know that those cliffs had “retreated episodically at an average rate of 0.5 to 0.6 meter (1.5 to 2 feet) per year over the past 146 years.” But lacking geologic backgrounds and unaware of natural weather cycles, developers’ ability to estimate a “safe distance” was hampered by the episodic nature of coastal erosion that could lull people into believing erosion was minimal. Minimal erosion may happen for decades when La Ninas divert the storm tracks northward, during which time naïve homebuyers and builders are not alerted to inevitable future threats. Those mild periods are soon followed by rapid losses during El Nino events. Thus ill informed in 1949, developers constructed several homes at the top of a 20-meter sea cliff along Esplanade Drive in the city of Pacifica. 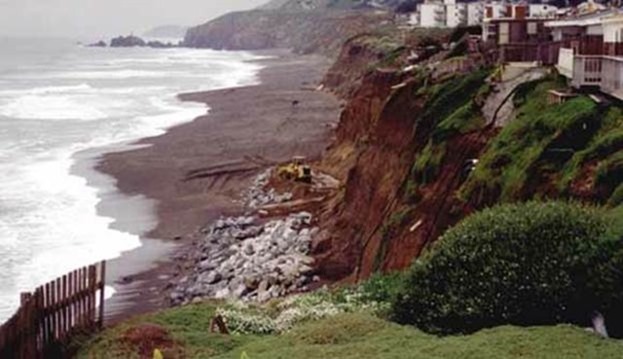 During the heavy winter storms of the 1997/1998 El Niño, 10 meters of local coastline were rapidly eroded, eliminating the last vestiges of the backyards that had survived the 1982 El Nino (see pre-1997 photograph below). In 1997/98, seven homes were undermined and three others threatened. All ten homes were eventually condemned and demolished. Nonetheless early developers should have been more cautious and alerted by past catastrophes. Early entrepreneurs in California were eager to develop its vast potential. The Ocean Shore Railroad was built, hoping to link San Francisco to Santa Cruz and entice more immigration into the area, as well as to transport lumber and agricultural products. Where the terrain was too daunting to go up and over, they chiseled out ledges that circumscribed the coastal cliffs. Scheduled to open in 1907, the 1906 San Francisco earthquake disrupted those plans. Pacifica lies just south of the San Andreas Fault, and its movement dropped a length of 4000+ feet of right-of-way along Pacifica’s fragile sea cliffs into the sea along with all their railroad building equipment. The surviving railroad ledges can still be seen today. If you spend enough time walking along Pacifica’s beaches, you would recognize an annual pattern of beach erosion. Heavy winter storms carry the smaller grains of sand offshore restructuring a sandy beach into a bed of rocky cobble. The gentler waves during the summer return the sands to the beach and bury the cobble. The currents will also carry some displaced sand down the coast, while those same currents also carry sands from further upstream. When not enough sand is delivered to replenish a beach, it undergoes rapid erosion. So in addition to natural changes, the damming of rivers that halt the seaward supply of sediments can starve a beach and promote erosion. Likewise when naturally eroding cliffs are armored at their base by boulders, the lack of local erosion can starve adjacent beaches of needed replenishing sediments. Because of that possible impact on neighbors, the California Coastal Commission now requires a permitting process before any seawall can be built. Finally jetties that are built to protect harbors often block the transport sand along the coast, starving beaches down stream from the jetty and causing amplified erosion. In many locations, governments dredge regions of sediment build-up, and dump those sediments where beaches are now starving, such as being done by San Francisco just north of Pacifica. This region’s coastal erosion is episodic for well-understood reasons. When a cliff face collapses it leaves a pile of rubble at the cliff’s base, sometimes called the “toe”, which raises the beach and acts to naturally buffer the cliff face from further erosion. After several years, waves and currents carry the buffering toe away, and eventually exposes the cliff to another “bite” from the ocean. Furthermore the Pacific Decadal Oscillation is expressed as a 20 to 30 year negative phase with more frequent La Nina’s alternating with a positive phase with more frequent El Nino’s. The relatively stationary high-pressure systems prominent during La Nina’s, forces storm tracks to the north of California. Fewer storms mean less coastal erosion, but also result in more California droughts. The current return of El Nino now allows storm tracks to attack the California coast. Snow is currently above average in the Sierra Nevada and reservoirs are filling, but simultaneously coastlines are more heavily eroded. In addition, the effect of higher rates of precipitation associated with El Nino also cause greater slippage between geologic layers that differ in their ability to handle subsurface water flows. Heavier precipitation caused episodic collapses of coastal Highway 1 at Devil’s Side at the south end of Pacifica. A tunnel was just built to re-route the highway away from that geologically unstable area. For millennia El Nino cycles have caused these natural extreme swings that alternate between droughts and floods and episodic coastal erosion. Changing your carbon footprint will never stop the process. But knowledge of these natural processes will keep people out of harms way. One of the greatest sins of the politics of the climate wars is that people are not being educated about natural climate change. They are not being taught how to be wary of natural danger zones. Instead every flood and every drought, every heat wave or snowstorm is now being hyped as a function of global warming. After every catastrophic natural weather event, yellow journalists like the Washington Post’s Chris Mooney or APs Seth Bornstein, seek out CO2 alarmist scientists like Kevin Trenberth or Michael Mann, to make totally unsubstantiated pronouncements that the event was 50% or so due to global warming. After centuries of scientific progress, Trenberth and his ilk have devolved climate science to the pre-Copernican days so that humans are once again at the center of the universe, and our carbon sins are responsible for every problem caused by an ever-changing natural world. You can recognize those misleading journalists and scientists who are either totally ignorant of natural climate change, or who are politically wedded to a belief in catastrophic CO2 warming, when they falsely argue, as NBC news did, that “frequent swings of opposite extremes” are due to global warming. El Nino’s naturally bring these extremes every 3 to 7 years, as well as the 20 to 30 years swings of the Pacific Decadal Oscillation. These swings have occurred for centuries and millennia! The same storms that bring much needed rains will also batter the coast and increase episodic erosion. But by ignoring natural change, climate fear mongers delude the public into believing La Nina-caused droughts of the past few years were due to CO2 warming. And now as El Nino returns the rains to California, those same climate fear mongers want us to believe CO2 warming is causing an abrupt swing to heavy rains and coastal erosion. One needs only look at the historical records to find Pacifica’s coastal erosion was much greater around the 1900’s, and that El Ninos have caused natural extreme swings for millennia. Honest science, useful science, must educate people about our natural hazards and natural climate oscillations; so that people do not build too close to fragile cliff edges or build in the middle of a flood plain. It is not just the coast of California that is eroding. The politicization of climate change is eroding the very integrity of environmental sciences. Reducing your carbon footprint will never save foolishly placed buildings in Pacifica or stop the extreme swings in weather induced by El Nino’s and La Nina’s. It was the end of the Ice Age that initiated dramatic coastal erosion and only a return to those frozen years will stop it. Pacifica’ eroding bluffs are simply evidence that most of California has still not reached an equilibrium with the changes that began 18,000 years ago. Pacifica is truly an icon of natural climate change. But the ranks of climate alarmists are filled with legions of scientific ignoranti who blindly see such coastal erosion as another “proof” of impending CO2-caused climate hell. This group lusts for climate catastrophes to prove they are not blindly paranoid. Other self-loathing CO2 alarmists simply lust for climate catastrophes that will deal humans their final “come-uppance.” So they too lust for climate catastrophes. Only a solid of understanding of natural climate change can prevent this climate insanity and pave the way to truly scientifically based adaptive measures. January 30, 2016 in Climate News. “For millennia El Nino cycles have caused these natural extreme swings that alternate between droughts and floods and episodic coastal erosion. Changing your carbon footprint will never stop the process. But knowledge of these natural processes will keep people out of harms way”. Just plain old common sense. It’s just natural conflict between water and land. Water tends to erode the land, and it wasn’t for tectonics, after billion or two of years we wouldn’t have had any dry soil to walk on. Climate change through ice ages to MWP, LIA and if you wish ‘warmest year everrrrr’ is just the sun’s and tectonics’ doing. Much too simplistic and misleading [as usual]. Let’s just be grateful to the tectonics that we are not cetaceans. Yes, life (particularly photosynthesizing and shell-building organisms) is also important. The man means well, do ya gotta be so nasty ? Well-meaning is not enough. One also has to be at least somewhat plausible, and Vuk’s stuff is pure pseudo-science. My remarks were directed at Vuk, not at Steele. So, explain to me how Vuk’s utterances adds anything of value to Steele’s. Lief, you can’t really complain on one hand about someone being OT and then on the other hand go OT yourself with your diatribes, without looking like a complete hypocrite. You started another fight. Own it. So be it. Pseudo-scientific nonsense has to be stamped out as soon as it rears its ugly head. Now, if you want to subscribe to Vuk’s nonsense, admit it. Bob Weber 12:49 is, of course, ON topic, talking about what he considers to be off topic. Hey boys and ladies throttle back a bit. Dr. Svalgaard is a good friend of mine, he gets me data whenever I ask. He finds my comments irritating because he knows there are based on good data. I find Dr. S’s comments amusing because I know he is concerned that data challenges his view of the natural world. Given how MANY times Mr. Vukcevic has mindlessly continued to assert his half-truths, how MANY times V. has ignored intelligent, well-informed, instruction, he brings the blunt response upon himself. Perhaps, a bucket of cold water dumped on V.’s head? Nah. He’d just grin and say, “There! You see? Since what I say makes you annoyed, I must be correct! Wheeee! Sun and tectonics ALONE, foreverrrrrr!…..
You sound more and more like a bitter old man who flings abuse at anyone who doesn’t agree with you. Please try to be a bit more civil. To me, Dr. Svalgaard just sounds like a typical Dane or Norwegian. And only an angel (who knows as much about the subject matter at issue, here) could suffer a fool (on this subject matter) like Vukcevic with a smile. Dr. S. is just human. And, as I told a commenter who seems to have disappeared, Ger@n, when he rebuked Dr. Svalgaard for being blunt, perhaps, I am a bit defensive out of an unconscious guilt at my OWN harsh criticism of Dr. Svalgaard when I first encountered his responses on WUWT about 2 years ago. I yelled at him more than once for being rude and harsh… . Over time, I have, I think, come to understand him and his position on AGW better. Ah, well. So, I UNDERSTAND all the “don’t be so mean to V.” comments above, but I still stand by what I wrote. V. would try the patience TO THE LIMIT of anyone who had Dr. Svalgaard’s knowledge and who had made as many attempts to correct V.’s mistakes as he has. Thank you for your observations, you are being far too kind, ‘a man of superior ignorance’ as once was said, might be more apt. To the contrary I try not to comment on personality traits of anyone. Challenging established concepts by relying on the best available data is far more fascinating and a better use of my time and limited ability. Jim’s well-written article lays out how the CO2 people just don’t think things out, and how they don’t learn anything from history. CO2 does not cause sea level to rise or fall, no warmist has demonstrated how that could happen, and there is no evidence for that happening. Further, it looks like very few understand how natural climate change occurs, or that it even happens at all. I’ve seen many SLR graphics with a similar profile, which does coincide very well with the overall ocean temperature rise since the solar Dalton minimum of the early 1800s. This slowly happened as a result of thermosteric SLR, which occurs from the expansion of sea water from a reduction in density of warmed up water vs more dense cooler water that sinks. The warmed up water expands and rises to and stays on the surface. Most of the heat in the ocean heat content data is in the top ocean layer. Gradually increasing solar activity from low levels during the Dalton minimum to higher levels thereafter warmed the oceans. Accumulating heat in the ocean from the net increase in energy input from the sun over many solar cycles over the past few hundred years brought the sea level up through thermosteric expansion. One can even see the ‘pause’ at the tail end of Jim’s graphic, which was caused by the slowdown in solar activity post-2003. The latest upswing in sea level since 2008 is solely from the recent solar cycle maximum and higher temps. SL will go negative into the next solar minimum as temps drop, and so on. If we experience a few low level solar activity cycles back-to-back as we did during the Dalton, sea level will drop again as it did during the Dalton, until sufficient solar activity finally kicks it back up by depositing and accumulating more energy into the top ocean layer over time again, and so on. I see leif is still trying to push the simplistic notion that the sun plays no role in climate changes. That must be the null-hypothesis until compelling evidence is found. I fail to see how that could be true, for it seems to me that a great deal of compelling evidence already exists which renders the Sun the reason we have weather/climate (turbulence in the atmo/hydrosphere). No one has to prove that the Sun makes each and every individual variation in that turbulence, it seems to me. I think you are confusing matters. The sun is the primary heat source of the atmosphere and as such drives all the interesting Weather/Climate effects we see every day. The question is whether solar magnetic activity has any detectable effect, and, so far, no compelling evidence for that has emerged in spite of almost 400 years of looking for such. It’s just the “no role in climate changes” aspect I was concerned about, in terms of the “nul hypothesis” being a “must” against. When one is claiming that a very small effect possibly exists, the NULL-hypothesis must be that it doesn’t. That is, you likely are in quite close agreement. The Sun causes short-term effects, but, the long-term shifts in climate, those of centuries-long endurance, are “not-proven” driven by the Sun which is, so far as we can prove, only the maintainer of the homeostasis of earth’s climate (versus weather). Right, I just didn’t want anyone to think it applied to something like the Sun, which is not a small effect. If it is not a small effect we would not be discussing it as we have been for 400 years without coming to a conclusion everybody can agree on. “Small effect” = small effect as to a climate SHIFT (versus short-term weather effects). That is, the Sun = BIG overall steady heat source, and the maintainer of homeostasis of earth’s climate generally, yes. However, as to the Sun having a big effect in terms of driving a long-term climate SHIFT, apparently, it is too small to be ascertained. Yes . . and as the ocean continues apparently to be about the same, and the big overall steady source of cliff change at Pacifica, the Sun could be the source of climate change on earth, while itself remaining about the same. The Sun has many effects on the Earth, including things like allowing reefs and forests to grow, waves to erode shores turning coastal mountain range tops into small offshore islands and so on. Stasis is not a given, even if the Sun remains essentially the same. I don’t know that is true, both for reasons I just tried to touch on, and because we have only recently been able to observe changes in the Sun with much precision, and we have not experienced any long-term climate SHIFT while we were “watching”. For instance, if the Sun goes to sleep sunspot-wise, we might now be able to detect a increase in cloud cover, which would be something big enough for us to ascertain, but could not have determined in the past. I find the V. vs L.S. petite feud ammusing, but somewhat distressing. Both are good folks. Both think well. Both present interesting things. Yet L.S. can’t stand to let an innocent statement pass without dumping on it with a slur. Sad, really. V. states a truth in a slightly poetic way, and L.S. attacks it as too simple? Well that is what any summary understanding less than an encyclopedia will be. So what. There ARE only two major agents of land change on the planet. Geology derived from atomic decay heat makes the land and raises it up. Solar driven wind , rain, snow, ice, and waves wear it down. Whenever one of these wins the race, the earth as we know it will end. Decay heat is likey to become too little in the next billion years as the sun becomes larger. We leave, die, or become aquatic. (IFF whatever we have evolved into by then can be called human…) V. is right on that. Too simplistic? Yes. L.S. is right on that. There IS biological driven geology (carbonate cliffs …) and more. Yet isn’t life just solar energy on a longer detour to space return? The other details can similarly be assorted. Ah, well. The Show Must Go On! I love both of them being here and would not change a bit of it. Pseudo-science has to be countered even if disguised as levity. Although Vuk provides some entertainment it is at the expense of a diminished WUWT. Some people are OK with that, I am not. So, go ahead and be sad for my trying to uphold at least a minimum standard. You were so kind as to address your remarks to me that I am responding (for the last time on this thread — I’m not at all worth your time discussing this topic — I only hoped to enable the conversation a little). Thank you for taking the time to try to explain your thoughts about Sun and climate shifts. I am far too ignorant (in the strict sense of that word) to even begin to assess them. Many bright, far more informed, and scientifically educated than I, thinkers pose the same or similar arguments/thoughts as you have. A man whose mind I highly respect persuaded me that there is much to learn and good reason (though not proven, yet) to believe the Sun may drive climate shifts (he focuses on solar chemistry). I can have no opinion on it, I say CAN-not, for I simply do not know enough to say anything except that some of the arguments sound plausible and some… not. I hope that you can find someone of Dr. Svalgaard’s calibre to discuss this science with — he is not likely to devote much time to that, here, I think. Hey! Maybe you could find out where he is teaching a class or seminar, take it and then, talk with him afterward. If he is as generous (with data sharing) as Vuk (who would do well to LISTEN to Dr. Svalgaard at times) says, you would likely find him open to your honest, thoughtful, questions. Above all, he is a teacher. THAT is his joy. That is why, gruff as he is at times, he comes here. Well! I am (yawn) tired. Glad YOU are here. Sincere seeking after science truth such as you demonstrate, here, is what makes reading the comments on WUWT worthwhile. Speaking of solar chemistry, have you noticed Mr. Robitaille? (I almost asked Mr. Isvalgaard to comment on his stuff) . . This one seems to have his ducks all in a row, so to speak, and may be on the verge of changing everything “we” thought we knew about Mr. Sun. Take look when you get a chance, I suggest, I haven’t been able to find anyone disputing his ideas . . and they could change everything . . I haven’t been able to find anyone disputing his ideas . . and they could change everything . . He is a crank of highest order. Nobody really cares about disputing such nonsense. It is like if somebody claimed the Earth was flat: nobody would spill ink or breadth disputing that. I’m glad you were encouraged. I wasn’t going to post on this thread again, but, seeing your name in the recent comments just now, I came back to see if you read my remarks to you above. Thank you for your kind words. Just so you can know not to bother, I am (please forgive me) not going to look at that info. you posted. I just do not have the interest in it that you do, nor do I likely have the knowledge to intelligently assess its accuracy or plausibility. This article, just FYI, is one I DID read and took notes on. It seems to make quite a bit of sense. Don’t bother to comment on it to me, here, I really don’t want to try to discuss an issue about which I know SO little. But, thanks for thinking of me! Gray, L.J., J. Beer, M. Geller, J.D. Haigh, M. Lockwood, K. Matthes, U. Cubasch, D. Fleitmann, G. Harrison, L. Hood, J. Luterbacher, G.A. Meehl, D. Shindell, B. van Geel, and W. White, 2010: Solar influence on climate. Rev. Geophys., 48, RG4001, doi:10.1029/2009RG000282. From what I have read of Dr. Svalgaard’s writing, you would do well to listen carefully to what he says. Try to ignore the tone (at times). I don’t do human authority worship, lsvalgaard. It is fitting to give credit where credit is due. Credit sure, but not blind faith. Present a rebuttal and I will consider it. Point me to a rebuttal/ and I will consider it. Tell me he is being ignored and I am unimpressed. 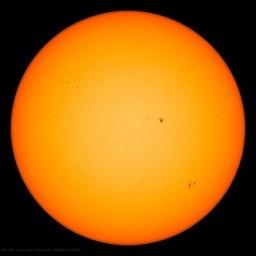 If the current experts on the Sun have no strong rebuttal, they will ignore him, I figure. They have much to lose if what their status/career is based on, becomes a passe notion about the very nature of the Sun. They become non-experts on the Sun . . ya know? What you are is of no concern to anybody. Good post. I used to weekend south of there some years ago, and the cliffs would change every year. Devil’s Slide is appropriately named. Thanks to the tunnel, that 1.5 mile section of Highway 1 at Devil’s Slide is now a park that you can walk, and I do so several times a week. 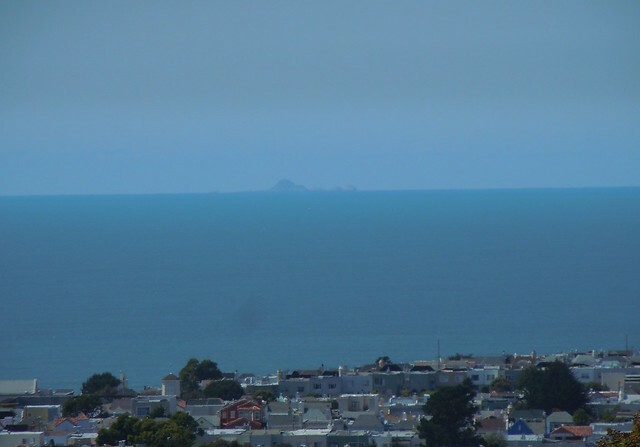 On a clear day you can see the Farallon Islands on the horizon. Those islands were the tops of California’s coastal hills at 18,000 years ago. Current vastness of intervening ocean is a tremendous visual illustrating the power of natural erosion. Those islands were the tops of California’s coastal hills … . Thanks for another great article, Jim Steele! And, thank you, so much, for all you do for freedom. Truth sets us (and animals, too) free. And thanks for posting the pictures of the Farallons. Back in ’96-’98 I worked for a company officed in the top floors of Spear Street Tower, adjacent to One Market in San Francisco. When we’d bring recruits in for interviews I always made it a point to take them onto the roof–from which on a clear day one could see the Farallons (and a tremendous expanse of the Bay, Marin, etc.) It always closed the deal. I’m assuming those doors were well-locked after 9/11! Jim, with this rapid an erosion, I’m surprised there wasn’t a good seawall, bulkhead or other coastal protection built as is common for coastal cities worldwide. It would seem that significantly more of Pacifica is doomed to be destroyed in the next 100yrs without it. I’m also surprised that there isn’t some municipal code that would prevent construction in such a vulnerable location. California coastline is about 840 nautical miles/1,350 km. 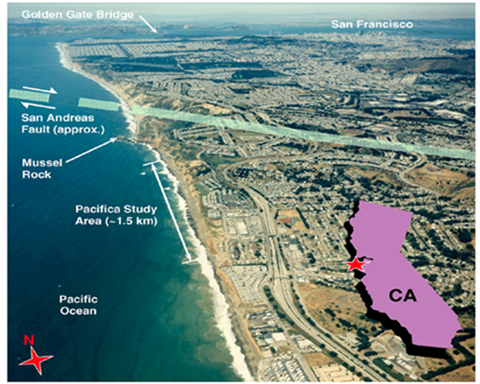 Here’s a look at a shoreline CAP study to address 7 Pismo Beach miles of shoreline. The Study costs alone are over a million dollars. What we’ve got is regulatory overreach which impedes an overall solution. 0.5 to 0.6m/year isn’t something to worry about, just something to be aware of. 100 years of erosion means 50 to 60 metres of ‘loss’ so building 100m in from the edge will give you a home that will survive you and your immediate families lifespan. Seawalls and/or bulkheads pander to the ‘worriers’, less so the ‘thinkers’. Actually, sea walls enhance the erosion of the area in front of them due to the dynamics of what happens when large waves hit them. The transported mass of water has to go someplace, and the surface transport is toward the wall. The transported mass thus goes down to the bottom and creates a reasonably strong current that moves sand, etc. out to sea. This accounts for the undermining that Mr. Steele notes for his boulders. But this is assuming that extrapolating past erosion rates to the future is valid. If I were locating within 100 meters of the edge of a cliff, I’d want wheels under whatever I live in. Rockaway Beach has a extensive rip rap seawall. There have been periodic placement of riprap at the base of more threatened cliffs attempting to imitate a natural toe, but those boulders are eventually undermined. So its an ongoing process. Gary, In the Newark quake, some cliff areas rose several feet. California is a very dynamic place and attempting to freeze it is doomed to failure. It is a very bad idea to insert yourself, or seawalls, between 50 foot waves, tsunami, mag. 9 quakes, feet of uplift in a moment or hundreds in millenia, falling cliffs (and houses and trains and boulders and …), tons of migrating beach sand, fires floods and mud sliding hills, along with the every 30 years or so “reimagining” bulldozers and constuction crews. Better is just to accept what is, hang on, and enjoy the ride…. Beautifully written post. Good for calling out Mooney and Borenstein. As for the local tide gauge SLR, the California coastline they are placed on does not stand still–labeled San Andreas fault is sufficient evidence. Need differential GPS land motion adjustments in many, but not all, global tide gauge locations. The recent SLR slowdown in the post chart is more likely the land rising, itself a possible earthquake precursor. Perhaps but it is also is a function of the Pacific Decadal Oscillation and the strength of the winds. Either way the lack of a relative sea rise minimizes that effect as an explanation for the current erosion. Photographs of these houses are popping up on message board fora now with extra-expressive and emphatic no attached comments as though to say “what more evidence could any reasonable person want!” The profound levels of displayed ignorance are a little sad to see of course but also just hilarious. Thanks for the informative and entertaining essay. Thanks for presenting the facts. As an infrequent left coast visitor; it’s exactly what it looks like from the plane; Cliffs eroding into the ocean. Then you look at the cliffs that appear like some kind of clay and rock and wonder how can any of this stand. Then you see the cliff fencing to constrain the slides. I suspect that if it rained more, it would be a lot gentler slope to the water. America’s west coast is still in active uplift. Much of the debris carried up in the uplift is not solid rock, but literally soil and rock that eroded in earlier times. Attempts to fence off cliffs is not attempts to constrain the cliff, but to prevent people and animals from merrily walking off or jogging off. Building on slopes or cliff sides anywhere on the west coasts on North or South America is an exercise in Darwinism. If the land doesn’t slide down, there is always a chance that a tsunami will come visit. They belong next to the close-ups of garbage floating in Hong Kong bay when discussing ocean plastic scares. Thanks for the essay. Any minute we can expect Gov. Moonbeam to announce federal and state aid to Pacifica property owners and tenants for Climate Change reparations. He’ll add it to the list of nasties CO2 is heaping on us poor Californians as proof we’re all doomed. The only part of the story that is missing doesn’t relate to science. At some point in time the coastal land was put into private ownership ($100,000). Some years later a wealthy individual or group bought the land for $1M. They then subdivided (permitted by government) it to increase the value to $10M. It was sold to a developer for $50M, who subsequently built residential structures and sold them for $100M. The municipality assured building codes were met, collected permit fees, and added to the tax base. As the buildings now topple into the sea, insurance (a collective) or climate mitigation monies (a collective) will compensate for losses. That’s one heck of a lot of “profit” and “compensation” with no enforceable responsibility. Common sense is trumped by profit. Hmmm- Jersey Coast? New Orleans? Another great article by my favourite author. The moral of the story, erosion happens. The Chinese are currently building islands in the South China Sea and California is whining about erosion caused by natural forces and red tagging coastal properties. Wouldn’t a simple solution like extending the beaches, adding breakwaters, and planting the hillsides …. This reminds me of a recent trip to Catalina. Catalina is surrounded by water yet relies on rainfall for its water supply. English were great railway lines builders , but even they couldn’t plan for the ocean’s destructive forces. And Flagler had the same problem in Florida! Well actually they could, and now they do. 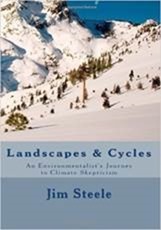 Jim Steele – a really good post – I loved your book and lend it to others to explain why natural processes are much more important than AGW etc. Now – about the UK railway builders planning for natural forces. Certainly they did learn that they had to do it and perhaps now they do. but the preeminent example in UK of lack of such planning is Folkestone Warren. I worked for British Rail in the early 1970’s and as their only geologist – was given responsibility for the monitoring of the Folkestone Warren landslide. The railway from Dover to Folkestone was built along the undercliff on the toe of the landslide which is a series of enormous circular slips of the chalk cliffs on the underlying Gault clay. These have been happening since England was joined to France and the Channel opened. So they should have known better. in 1915 they found out the hard way as the line was destroyed (with a train on it) by a failure of the undercliff following erosion of the toe of the landslide. Since then, British Rail and their successors have tried to keep the line open by a series of tow weighting schemes and sea walls. In the end the sea always wins and I was looking at it following seaward displacement of the wall. We never solved it and I was happy after two years to move on to a career as Engineering Geologist in South Africa then Australia, where I am now. With regard to Folkestone Warren – we found that it was metastable and a small increase in the water table would tip it into instability and in the end, there was not a lot they could do. I haven’t followed its fate for a long time, but it illustrates the difficulties of trying to compete with natural erosion of a cliff. The power of water!! In Southern England the Isle of Wight was attached to the mainland…but a channel was wased in to existence. Hense we now have the Isle of Wight! These failures are mostly a result of a lack of maintenance. Just down the road from me the coastal erosion over a few centuries has famously removed an entire village. Here is a time-lapse photo of a famous church (All Saints Church, Dunwich, Suffolk, UK) gradually disappearing since 1736. The cliffs are static most of the time, but when there is a once-in-a-decade storm several metres of cliff fall into the North Sea. Conversely, at Rye and other places on the South Coast (and, strangely, other parts of Suffolk), coastal deposition has “moved” mediaeval ports a mile or so inland. This has been happening for centuries, but when the BBC interview farmers and house-owners whose property is about to disappear, the reporter always splices in “caused by climate change”! It is like those people in the Carolina’s that build on barrier islands…what happens when there is a surge or other catastrophe caused by a hurricane? Must be climate change! When Lake Ontario was at a high point in the 70s and backyards began to fall in, what was the cause? It surely couldn’t have been ill informed developers building too close to the bluffs…could it? I suspect that NBC will not be posting a retraction. People here in Vancouver talk about rising sea levels, so I downloaded the daily max and min tides from Victoria (from 1909 to present) and Juneau (from 1993 to present). Victoria is dead flat – the only change in sea level is a negative trend that is smaller than the noise. In Juneau, sea level is decreasing at 13mm / year. Am I correct to understand that we will soon have a satellite observing global sea levels? That would be good I think – when we put up a satellite to measure air temperature, the warming trend stopped. Juneau land is rising more than 13mm/year. Tectonics. I used the example in essay PseudoPrecision about SLR. Might also be an after-effect of the melting of the Cordilleran ice-sheet. Northern Europe and northeastern North America are still rising, so it is likely that BC and southern Alaska are too. Tty, maybe a bit. Sure. But nowhere else is isostatic rebound >13mm/year. Alaska is mostly tectonics. ristvan you said “Alaska is mostly tectonics.” That set off a few questions. Most of Beringia was ice free other than the highest mountains. That would suggest that there would be very little rebound. Do you have links explaining why there would be so much uplift? Are there GPS studies showing that amount of uplift? The weight of Arctic glaciers depressed the Arctic but caused a rise at the periphery in the sub-Arcitc/temperate regions. The New England. eastern USA coast is believed to have risen during the Last Glacial Maximum but those coasts areas are now sinking. If Alaska was affected similarly perhaps there is not so much uplift. Jim, yes, and yes. They are in footnotes to ebook essay By Land or by Sea. For Alaska specifically, start at Alaska Earthquake Information Center, geophysical Institute, UAF (University Alaska, Fairbanks). Sorry that my really old iPad won’t post direct links. The image from that source in my ebook essay shows a roughly 8meter beach height increase in about 800 years, in four major terrace ‘events’. The vertical from ocean uplift from the 1964 earthquake alone was measured at 3.6 meters at the UAF pictured beach location! So Alaska’s uplift is not due to glacial isostatic rebound but due to tectonic activity? for some reason apparently most of Siberia and large parts of Alaska were free from ice sheet. This is hard to explain simply by drop in insolation. Associated article (lecture by Professor Phil Gibbard) has no details on the matter. Oh, and an earlier subduction (of the Farralon Plate?) likely gave us the Rockies, gold in California and Colorado, and the uplift that let central USA drain out the inland sea. If a whole tectonic plate can be rising (even the part under water) and if all of Hudson Bay can be rebounding (even the part under water) then that implies that melting ice is not the only phenomenon that affects sea level. I can see how climate change (both natural and anthropogenic) has influenced glacier melt and thus influenced sea levels. But perhaps tectonic movement is an even greater influence? I cannot imagine how CO2 levels can influence tectonic movement, so an important question for the Warmers to address is: what fraction of observed sea level rise is due to melting ice vs uprising land? It is much worse than they thought, they will say. All of it will be anthropogenic. Another great article and thanks, also to vukcevik for the picture of Dawlish on the West Coast of Devon. Pacifica is far from unique. 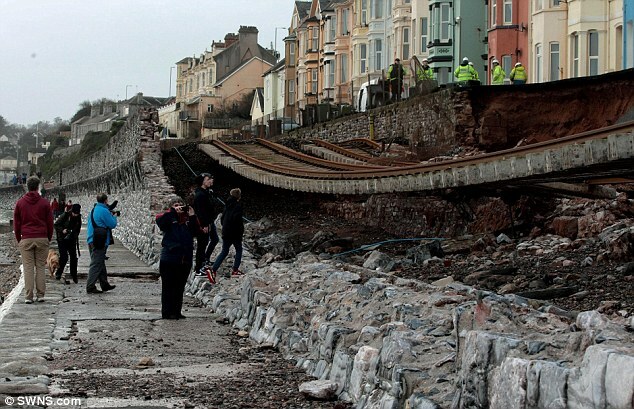 Parts of the East Coast of England has actually eroded faster than the West Coast of California. The following is extracted from Wikipedia. Originally, Walton was a farming village situated miles inland. Over the centuries large quantities of land were lost to the sea due to coastal erosion. The mediaeval village of Walton now lies nine miles out to sea with its old church finally succumbing in July 1798. Its last service was held on 22 July 1798. This loss of land to the sea is a fact recorded on a Canon’s stall in St Paul’s Cathedral with the inscription Consumpta per Mare. In the case of the Naze the erosion is actually a scientific boon since the eroding material contains a lot of interesting Eocene fossils which are otherwise unaccessible. Since the Early Eocene was extremely warm and is often used as an Awful Warning no right-thinking CAGW:er should begrudge a bit of erosion there. Good point that most of the anthropogenic change we see has nothing whatsoever to do with CO2 emissions. I blame the local education system which conflates all anthropogenic influences into a unified cause. This makes it difficult to distinguish between influences which have a mostly positive impact, for example producing energy, and those which have a mostly negative impact, for example, habitat destruction. Fond remembrance. If his wish for the power of love to overcome the love of power had come true, we wouldn’t need to blog here about this apostasy in science. ““a brief window into what the future holds as humans build in stupid areas and governments give them insurance when private companies won’t ” – There. Fixed it for them. In the 1950s about 5 houses in Daly City, just north of Pacifica, similarly went over the edge. In 1962 I went on a field trip with an Engineering Geology class from UC Berkeley to see the San Andreas fault where it goes out to sea. We were all shocked to see a housing development being built directly on top of the fault. I think the houses are still there and if so I wonder if the people living in them know of their peril. To be fair, if you own a section of cliff top and you want to build there in order to take advantage of the view across the ocean, that’s ok. As long as you don’t expect public funding to protect your spot of heaven, and you don’t complain when nature does what was inevitable. Agreed. If governments did not alter the real risk/reward ratios by subsidizing insurance for buildings placed in knowing potential natural disasters, then to protect their investment people would need to be more careful about estimating the risks. People would naturally avoid such sensitive environmental areas when given the facts. I have spent all (so far!) of my life in areas that once were glaciated, and most of that time in New Hampshire, the Granite State. On my first trips to California I was amazed at the mountains of sedimentary rock, or material that might have been sedimentary once upon a time but were now more akin to dirt. In New Hampshire, when we make a rock cut, it either stays put or the whole side falls down. I’ve alway thought you guys needed a good glaciation to put those hills in their place, in the valleys. Of course, we also have sand piles left by terminal moraines, e.g. Cape Cod, Martha Vinyard, and Nantucket along with filled in areas away from the mountains that support things like cranberry bogs. It turns out that some people here seemed to think that building for ocean views is a good thing. Our nor’easters think otherwise. Back in the 60’s any local building commissioner would allow any moron to build on the edge of the dunes along Lake Michigan, without much provision for siting or foundation requirements. The shoddy practices stopped when some rather aggressive dune legislation was enacted. But starting in the 80’s houses, one-by-one, started to slide into the lake. From South Haven, north, to Manistee, there were over 30 homes that were violently deconstructed by the forces of nature. Fortunately, back in the 80’s, no blamed it on climate change. Back in the 80’s there was no mass use of the internet enabling widespread and instantaneous infection of FUD and cargo cult climate change culture. My theory is that the great majority of Warmist believers are addicted to their own adrenaline. They get their daily fix by reading the alarmist spewings of Mooney, Borenstein, and others. Ignorant and malignant journalists act as pushers, feeding an addiction that turns people into mindless zombies, immune to logic, science, and common sense, ready to swallow even more odious propaganda. 9/11 was an inside job – Therefore climate science is correct. Get to work, Lew. Excellent essay by Jim Steele. Thank you, thank you, thank you! A wonderful blend of science and sociology! I especially loved: “After centuries of scientific progress, Trenberth and his ilk have devolved climate science to the pre-Copernican days so that humans are once again at the center of the universe…” This statement sums up the whole paradigm of modern environmentalism. which sees ‘nature’ as a perfectly balanced, static equilibrium, that is only disrupted by the presence of humans and their ‘unnatural’ behaviors. ANY change, therefore, must be the fault of humanity. This unspoken, foundational assumption of modern environmentalism is a completely religious concept and requires an ignorance of science and true environmentalism to be accepted. And it is accepted far and wide, especially in politics, journalism and academia. The acceptance in these circles is not because of any cognitive or spiritual insights, as they would have us believe, but simply because the belief in the assumption empowers their circles. They all gain power, prestige and/or wealth as long as people believe humans are the cause of most ‘changes’ seen in nature. These three groups are in a symbiotic relationship in which they promote and defend each others actions (often subconsciously) for the strengthening of their own positions, at a terrible cost to the rest of humanity. Since much of humanity sees these three groups as completely separate, the support of one for the other appears to be independent, lending authority to the message and strengthening their own faith in the false paradigm. Throughout human history, the masses have always created concepts of authority for the purpose of avoiding chaos. This is also known as exchanging freedom for safety. We submit to authority in order to be safe. But power corrupts and authority will naturally begin to exaggerate threats to the masses in order to gain more power. As H. L. Menken put it: “The whole aim of practical politics is to keep the populace alarmed (and hence clamorous to be led to safety) by menacing it with an endless series of hobgoblins, all of them imaginary.” To that end, we can now add scientific academia (now largely funded by practical politics) and the media (largely funded by the belief in hobgoblins). Since the whole thing is based on a false ‘pre-Copernican’ assumption of the nature of the world, it is doomed to fail. The cost to the rest of us, however, may be staggering!
. . . the whole paradigm of modern environmentalism. which sees ‘nature’ as a perfectly balanced, static equilibrium, that is only disrupted by the presence of humans and their ‘unnatural’ behaviors. ANY change, therefore, must be the fault of humanity. . . Yes, there is an implicit assumption of stasis (equilibrium, balance) in the whole notion of ‘ecology’. Sure, among biota (not counting geology) there might be tendencies toward equilibrium in micro-environments, but the concept has been elevated in the popular mind to an overarching myth, where the whole ‘planet’ would be an Eden-like Paradise were it not for the evil machinations of mankind. And then this myth becomes the basis for all manner of policies, regulations, laws. A neighbor was afraid to cut up a fallen tree near his river dock, lest the neighbors complain to the local Conservation Commission that he is disturbing the waterway. Great read Jim! Thanks for the thorough education on the subject. I would prefer the cliff erosion instead of the sink holes we have to deal with here in Florida…….. Many of the phenomena Jim describes are familiar , tho perhaps in miniature , from my childhood . The erosion of the cliffs and the littoral drift of sand and the capture by groins and walls was obvious to us as kids exploring the shoreline , much of it private . On Google Earth you can clearly see the scalloped shore showing the southward shifting sand . I remember there was a “cave” someone had dug ~ 2 m into the soft cliff which had disappeared by my teen years . The municipal beach came and went with the vicissitudes of the year’s weather . It’s criminal malfeasance when anybody in an official capacity denies this beyond proven reality . I remember watching TV coverage, a few years back, of waves hitting Gold Coast, Chicago, sea walls and splashing water up to 7 stories on lake front apartment houses/condos. Thank you Sir for yet another clear and concise article. Just excellent, and so enjoyable compared to the breathless calamity hawked by the CAGW cult. I lived in Pacifica for five years in the mid sixties. Landslides were a common occurrence, and Highway 1 was shut down quite often around Devil’s Slide. This was when Half Moon Bay was still known mostly for its brussels sprouts. Not exactly on-topic, but if you get to Pacifica, it has the most beautiful Taco Bell in the world, on the beach-side of the highway just over the waves. – bad weather is CLIMATE. The aerial photo shows a coastline that is eroding at about the same rate as that section of coast is being carried out to sea by the western tectonic plate sliding along side the San Andreas fault line. And this has been going for a very long time. Just how much closer to Japan have these structures moved in the last 100 years? “… any structure built within 20 meters of the sea bluffs’ edge in 1950, was doomed to fall into the ocean by 2015 …”. Anyone who builds their ocean view house near an exposed earth cliff-face is asking for trouble. 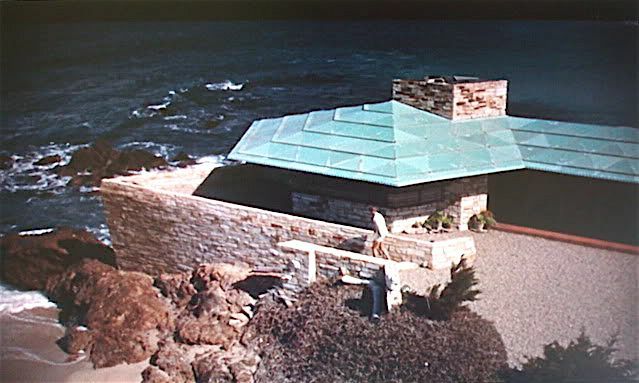 On the other hand In 1948 Wright designed the Walker house for a site right on the ocean at Carmel. Wright designed the terrace facing the ocean imitating the prow of a ship, I’m not sure that’s going to help when the seas suddenly rise 20 feet in 84 years by 2100 (Brian Kahn Scientific American July 9, 2015). Note the rock FRW built on. Robust. Unlike Pacifica. Btw, his original Talleisin design studio in Wisconsin is ~5 miles from my dairy farm. Built on a limeatone bluff carved by the melting of the last glacier (which not cover the Uplands, but which definitely carved the lower Wisconsin River valley. We drive by it on the way to and from, since county C is a backcountry shortcut to a short stretch of 123 and then county NN up Penn Hollow. County C west from 23 just south of Wisconsin River, just south of Spring Green. The Talleisin visitor center was originally the only FLR designed restaurant. We used to eat there. Not enough tourist trade from Madison to survive, and farmers don’t spend like tourists. Still has a ‘lunch bar’. Roof beam is part of a decommissioned WW2 destroyer keel. Just east of 23 bridge, north of C by 100 meters, on south side of Wisconsin River. Google Earth can take you there. Better to visit one of God’s countries in person. Summer rather than winter is strongly suggested unless you are trailing snowmobiles. O.T. — Frank Lloyd Wright was a genuine genius, one of those larger-than-life truly American characters from the heroic period that is sadly over. The area south or the apartments show a lot erosion on Google Maps/Earth, e.g a “concrete creek delta” or whatever you call such things, is displaced south. Start at https://www.google.com/maps/@37.6444044,-122.4935292,169m/data=!3m1!1e3 and work north to the apartments. Rick, I would have to study old photographs to date the image precisely but my browser says imagery is USGS 2016. You can see the heavy riprap all along the coast. Between the RV park and Manor Drive just south of the current Esplanade erosion there is heavy rip rap and then there is intermittent absence which I suspect was washed way. I don’t think the rocks “migrated south”. The were placed all along the area and if missing, were likely dragged seaward. The RV park lost a few pads during either the 1982 and/or 1997 El Nino so that area was armored. You can scroll southward from the RV park and sea the shore has been armored with riprap all the way down to the Sharp Park Gold Course. The course was created by creating dike that turned Laguna Salada, previously a natural saltwater lagoon, into a freshwater marsh and golf course. Hight tide often reaches the top of that dike. Ahh, Sharp Park. I played there in 1997, as well as down at Half Moon Bay. Fabulous area. I fired up my Windows system today in honor of tax season. I have Google Earth on that, so I took a look and found the most recent imagery is from 3/28/2015. I get the sense that people have concluded maintaining riprap and some other defenses is a waste of time and money. On Google Earth – while maps.google.com uses the same imagery, Google Earth is a separate application that lets you mark up images, plan “flyovers”, look at old imagery which will remind you how much better aerial photography is today than 20 years ago, and in general make you spend far more time poking around than you do on the website. From your reference to browser below, I assume your at Google’s map web site instead of running Google Earth. Stayed at San Francisco RV Resort at Pacifica in October and interesting to see how its loosing real-estate. Former RV park sites shortened at the edge and curbs hanging out over the cliff. Want to live on the shoreline, lots to be said for having a home on wheels. I was involved in the Michigan legislative process in FY86 when $6 million was appropriated for shoreline protection to address the record high water levels. A co-worker who had worked in the Great Lakes Shoreline Protection Program since the 1950s explained the cyclical nature of Great Lakes water levels where records have been kept over 100 years. For the last several years near record low lake levels were being blamed on AGW. They have now recovered and are close to long term averages. If I have to choose between hysterical uninformed press coverage and experience, I go for experience. 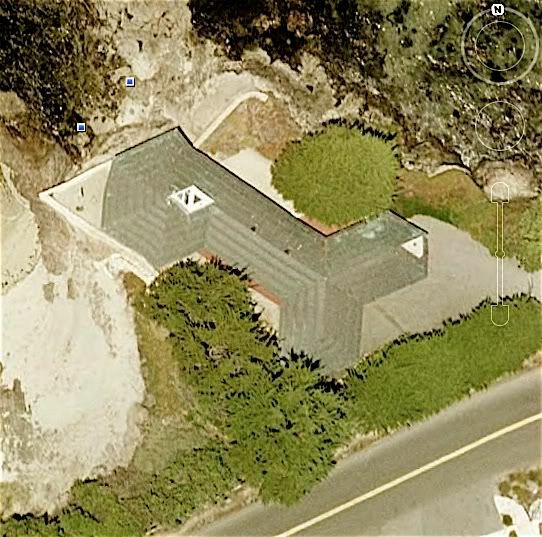 Google Earth’s ‘Show historical imagery’ button displays some interesting images of the Esplanade Ave coastal erosion and attempts to mitigate it. The earliest image is from 1993 then 2000 and every year from 2002 onwards. You can see from the images that it wasn’t until 2009 that any serious attempt was made to mitigate the erosion below the condemned buildings. Paul, Where do you see ‘Show historical imagery’ button? I don’t see that on my browser. That is a great tool I want to use. The ‘Show historical imagery’ is on my Windows version of Google Earth but it isn’t available on my ipad version. On the Windows version, select menu item view->toolbar (or press Ctrl+Alt+T), then it appears as a clock-like icon towards the top left of the window. Thanks, that explains why I do not see it. I am on a Mac, but it suggests the button is available someplace. I’ll click around and see what I can uncover. That is what I used in my comment below these. Thanks, Dr. Steele. This is a very good article for learning some geology. “One of the greatest sins of the politics of the climate wars is that people are not being educated about natural climate change.” You are correct, young people are being blinded in their minds by this cult of “Climate Change”, as if it could do anything but change, as it has been doing since the Earth formed. Static climate is a myth that is being exploited for money and power. Great article. Despite the tragedy that these building owners endure, I did find it amusing, bringing back memories of living in the Bay Area beginning in 1980. Beginning in 1981/82, stories of Pacifica real estate collapsing seemed almost an annual winter-season occurrence. 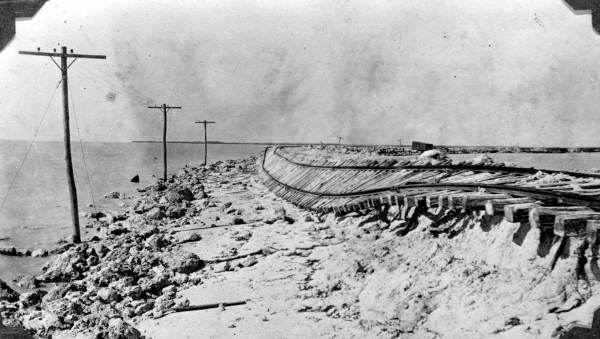 Now, down in Seal Beach, I’m looking at old photos where levees and sea walls were built over a century ago to retard coastal erosion, long before the magic 1950’s when C02 became the villain. Apologies for the kerfuffle and fuss caused by a brief comment I made at the top of the comments column. As someone who owes a property at a cliff top, fortunately of a far tamer Mediterranean, your excellent article (I just finished reading) is well appreciated. No problem. I fully expect clashes between posters. It does not prevent others from posting about the essay. But it was more bizarre that this dot on the map could be extrapolated into an icon of CO2 climate change. Though fuzzy the boundary between anecdotal an empirical may be, sure, one data point would clearly be anecdotal. OTOH, one thing empirical is NOT is “everything”. I could only laugh as ridiculous CO2 alarmists who metamorphosed a local disaster, brought about by ignorance of natural coastal changes, into a global warming “crystal ball”. One wonders how your professed knowledge of natural coastal changes can be extrapolated into an icon for others’ ignorance of same. But consistency is the hobgoblin of a good polemic. Starting this month, The Nature Conservancy is asking tech junkies to capture the flooding and coastal erosion that come with El Nino, a weather pattern that’s bringing California its wettest winter in years — and all in the name of science. The idea is that crowd-sourced, geotagged images of storm surges and flooded beaches will give scientists a brief window into what the future holds as sea levels rise from global warming, a sort of a crystal ball for climate change. Images from the latest drones, which can produce high-resolution 3D maps, will be particularly useful and will help scientists determine if predictive models about coastal flooding are accurate, said Matt Merrifield, the organization’s chief technology officer. Oh look, observational data being used to validate models because researchers themselves question their validity. Completely unheard of. Experts on climate change agreed that El Nino-fueled storms offer a sneak peak of the future and said the project was a novel way to raise public awareness. Because of its crowd-sourced nature, however, they cautioned the experiment might not yield all the results organizers hoped for, although any additional information is useful. c) not claiming that this one experiment contains all the answers they are asking about the future. Compare your statement: But it was more bizarre that this dot on the map could be extrapolated into an icon of CO2 climate change. I could only laugh as ridiculous CO2 alarmists who metamorphosed a local disaster, brought about by ignorance of natural coastal changes, into a global warming “crystal ball”. Funny what people find ridiculous when they only consider a tiny piece of the picture, innit? Only five years ago, an unusual weather pattern during an El Niño winter brought extreme wave heights and unprecedented erosion that tore away protective revetments along more than 3 miles of San Francisco’s Ocean Beach and damaged the Great Highway. Severe weather events across the entire Pacific basin have been increasing for more than 30 years and are expected to double in frequency in coming years, the scientists said in a report published in the journal Nature Geoscience. The coastal scientists who compiled the new report surveyed 48 beaches bordering the Pacific and analyzed detailed climate events around the Pacific stretching from 1979 to 2012 to reach their forecasts. They also considered forecasts of extreme La Niña and El Niño events published recently by a separate group of international climate and coastal scientists led by Wenju Cai, a climate modeler at Australia’s Scientific and Industrial Research Organization, Barnard said. The Cai group predicted that increased global warming and rising sea levels due to climate change would double the frequency of those severe weather events across the Pacific basin. So now we’re talking about conclusions drawn from other studies. It ain’t just about disaster junkies watching people’s houses fall into the ocean in for the spectacle and blaming it all on CO2. Such apocryphal stories fueled a menagerie of bizarre blogging alarmists. I was recently interviewed by James Corbett, which incurred the wrath of a few internet snipers trying to denigrate my scientific background. Apocryphal or apocalyptic? Either fits your argument I suppose. When you mock your colleagues for being ignorant about natural coastal erosion when they’re quite evidently not, which researchers also look to be actually doing something about learning more about it, I’d say you’re the one doing the most damage to your reputation and credibility, scientific and/or otherwise. The result, the group said in a report published this year in the journal Nature Climate Change, would be “more occurrences of devastating weather events and more frequent swings of opposite extremes from one year to the next, with profound socio-economic consequences. ====>>>Brandon, do you agree, and if so, why, to Cai’s assertion that Severe weather events across the entire Pacific basin have been increasing for more than 30 years and are expected to double in frequency in coming years? “Because they said so” is not a viable answer. Especially when last predictions….hurricanes, etc…..failed miserably. It’s just more making it up as they go and they find an untapped potential doom to plug into the AGW narrative. Indeed Bob. Cai’s empty assertion ” that Severe weather events across the entire Pacific basin have been increasing for more than 30 years and are expected to double in frequency in coming years?” is not science but weak speculation. There is absolutely no consensus regards any connection between CO2 and El Nino strength or frequency. Half the models project fewer El Ninos and the other half project more. Those who deceptively politicize science will always cherry pick a journal article that speculates catastrophic global warming. It is not science, it is not substantiated. It is pure speculation highlighted and abused by alarmists. markl, Your comment is spot on! 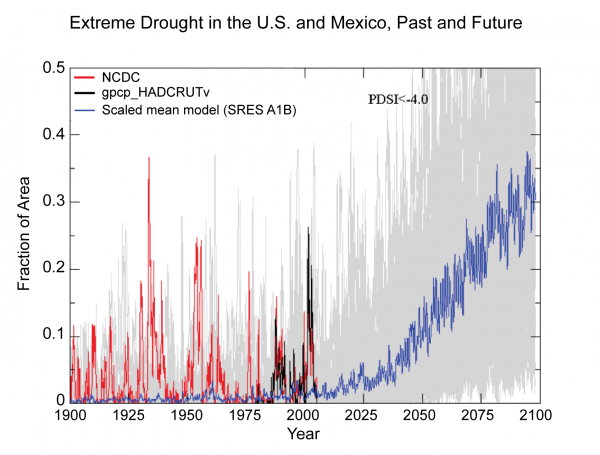 My favorite example of failed models that hype future catastrophes comes from a published paper on North American droughts that was highlighted in the last National Assessement. The models totally failed to simulate droughts over the past 100 years, and based on their models’ simulations there was no Dust Bowl. However the models did simulate increasing devastating droughts in the future. So the National Assessment ignored the models’ failures to simulate what was already known, and hyped the totally speculative future devastation. That is the type of crap Brandon Gates and his ilk promote. Who would ever trust a team of doctors with our health, if they had totally failed in their past diagnoses! What a bizarre statement. Californian’s have known what the term “surf’s up” means since the 1950s. It only started the alarmists claiming CO2 impact recently when they’ve been unable to seriously prove any CO2 effect. A blunt falsehood Gates. Jim Steele did not knock any colleagues. Which researchers? And what exactly are they doing? A couple of season’s of assumptions does not make research. Let us know exactly what fifty years of geotagged coastlines. I am especially curious how the scientists plan to identify which rock or which clump of sand is allegedly geotagged. Telling me how I may or may not answer is not a viable … “request”. I have not read the study, so I don’t have an informed answer to give you. Thank you for noting Dr. Steele’s treatment of these two news articles was, shall we say, less than complete. What a bizarre statement. Californian’s have known what the term “surf’s up” means since the 1950s. Like I said, potentially cringe-worthy. It only started the alarmists claiming CO2 impact recently when they’ve been unable to seriously prove any CO2 effect. What so-called “alarmists” allegedly do or don’t isn’t relevant to what Steele has done here. But it was more bizarre that this dot on the map could be extrapolated into an icon of CO2 climate change. I could only laugh as ridiculous CO2 alarmists who metamorphosed a local disaster, brought about by ignorance of natural coastal changes, into a global warming “crystal ball”. You can recognize those misleading journalists and scientists who are either totally ignorant of natural climate change, or who are politically wedded to a belief in catastrophic CO2 warming, when they falsely argue, as NBC news did, that “frequent swings of opposite extremes” are due to global warming. Which researchers? And what exactly are they doing? Read the articles to find out what they’re doing … you really shouldn’t need me for that. A couple of season’s of assumptions does not make research. Not conclusive research, no. One session of research is still research however. Pile up enough of it over time, and it becomes more meaninful. Pretty standard scientific practice. Let us know exactly what fifty years of geotagged coastlines. None so far as I can glean from these two news articles. The availability of relatively inexpensive drones, and a cadre of drone enthusiasts flying them is apparently what is making it feasible to begin gathering that kind of data. I am especially curious how the scientists plan to identify which rock or which clump of sand is allegedly geotagged. Why don’t you ask Dr. Steele here how he knows so much more about the history of natural coastal weathering without such data? Really? How do your antagonistic demands of Jim to write his article your way constitute a ‘viable request’? Don’t you think it’s a bit hypocritical of you to tell me that after you basically just told Jim how he should have written his article? Jim mentioned a few things from those articles you cited, but he or any other writer is under no obligation to satisfy your demand to write the article the way you want. I’m sorry Brandon, but your expectations here are unreasonable, and no one is stopping you from writing your own article. Thank you for honestly telling me you don’t know the answer. If you haven’t read the study, why are you defending it? If you don’t know the answer, why are you promoting Cai’s assertions? Because they said so? Do you agree or disagree that the world is going to just keep right on warming for the next 30 years as Cai infers, and how? How are severe weather events going to double in 30 years? Don’t you see the absurdity in these claims? It’s absurd for you to promote a study you haven’t read and then on top of it cop an attitude about the whole thing. Don’t you think it’s a bit hypocritical of you to tell me that after you basically just told Jim how he should have written his article? Jim mentioned a few things from those articles you cited, but he or any other writer is under no obligation to satisfy your demand to write the article the way you want. Of course not. I am free, however, to note that his OP made some glaring omissions. I’m sorry Brandon, but your expectations here are unreasonable, and no one is stopping you from writing your own article. You don’t get to dictate my expectations to me either. I don’t need, or want, to write a whole article to make the point I have already covered in my original comment. Thank you for honestly telling me you don’t know the answer. If you haven’t read the study, why are you defending it? I’m not defending it. I haven’t read it. Tough to mount a defense of something I haven’t read. If you don’t know the answer, why are you promoting Cai’s assertions? Because they said so? Do you agree or disagree that the world is going to just keep right on warming for the next 30 years as Cai infers, and how? I’ve answered that kind of question here more times than I can count. Why is my belief that the world will continue to warm as CO2 levels rise relevant to my critique of Steele’s OP? How are severe weather events going to double in 30 years? Presumably by happening twice as often. Cai et al. (2015) is not the only paper discussing this topic, perhaps you should read some. Don’t you see the absurdity in these claims? It’s absurd for you to promote a study you haven’t read and then on top of it cop an attitude about the whole thing. I think it’s absurd for you to say my critique of Steele’s piece constitutes a promotion of Cai et al. (2015). And back from chasing squirrels to the point of my original post, isn’t it funny how Steele accuses climatologists of being ignorant of natural processes like ENSO, PDO, etc.? “These swings have occurred for centuries and millennia!” he writes. From where does he get his information? Why does he believe it? Did he do the research himself, or did someone say so on a blog somewhere? Or was it peer-reviewed literature perhaps, hmmm? Funny thing is Brandon, I only suggested that you can write one – I didn’t dictate to you. Now you’re putting words in my mouth. With that statement you now have crossed the incredibility line with me. Janice Moore was wrong about you. You are not a subtle snake. You are a blatantly SLIPPERY SNAKE whose primary interest and skill is in sticking his finger in people’s eyes! There’s nothing subtle about you. You are nothing but a manipulative narcissistic abuser. Janice Moore was right about you. You misrepresented even what I said to you, so indeed, you are a teller of half-truths. Thanks Brandon for proving that for me, again. Perhaps I should read some? If it’s not the only paper discussing this paper, then are you telling me it’s not just because Cai et al ‘say so’, now it’s because a few other people ‘say so’? Is that not an appeal to authority? Poor argumentation. What is the scientific basis for your presumption that severe weather events will happen twice as often? The bottom line Brandon, is that you have a narcissistic personality disorder and you will never allow yourself to be held accountable, while you impose yourself abusively on others. Own it. Funny thing is Brandon, I only suggested that you can write one – I didn’t dictate to you. Now you’re putting words in my mouth. Funny thing is “dictate” was in reference to “my expectations”, not writing an article. Who’s putting words in whose mouth here? Perhaps I should read some? If it’s not the only paper discussing this paper, then are you telling me it’s not just because Cai et al ‘say so’, now it’s because a few other people ‘say so’? Is that not an appeal to authority? … isn’t it funny how Steele accuses climatologists of being ignorant of natural processes like ENSO, PDO, etc.? From where does he get his information? Why does he believe it? Did he do the research himself, or did someone say so on a blog somewhere? Or was it peer-reviewed literature perhaps, hmmm? More to the point: why do you apparently believe Steele? Because he said so? What is the scientific basis for your presumption that severe weather events will happen twice as often? What part of, “I didn’t read the paper so I cannot give you an informed answer” did you not understand? Why are you still asking me to defend a paper I’ve already told you that I am not defending because I cannot? Bob, I empathize with how you are being attacked by the Slippery Snake Brandon Gates, That he will lie and obfuscate has been documented and archived. When Gates argues “isn’t it funny how Steele accuses climatologists of being ignorant of natural processes like ENSO, PDO, etc. ?” is just another prime example of how Gates will slither and change the discussion. I never accused climatologists in general. I only accused alarmist scientists and journalists of hyping global warming speculation without ever accounting for natural change. Most honest climatologists will agree that El Nino amplifies erosion and will avoid engaging in a global warming debate, But the snake ignores the important details. Gates is Slandering Sou’s mini-me and her obsequious foot soldier. You can tell when the truth threatens Slandering Sou’s blather when she launches a campaign against a skeptical post as she has done now. And if history holds, you can tell her alarmist blather is further threatened, when she sends her pawns like Gates to undermine a blog post. Its predictably hilarious! I can see why you have trouble here. You’ve dug your hole deeper with every reply. I only accused alarmist scientists and journalists of hyping global warming speculation without ever accounting for natural change. El Nino is a natural phenomenon, is it not? Let me unpack that and see if I understand your meaning correctly. The climatologists quoted in the above news stories recognizing that El Nino (a natural process) amplifies erosion would have been ok in your book had they not also been engaging in a global warming debate at the same time. You’re exempt from avoiding global warming debate because you’re not a climatologist. It must be true if you say so. The core of Cai’s results, that more super El Ninos are likely, was disputed by Kevin Trenberth, a senior scientist at the National Center for Atmospheric Research. He said some of the models used in the study overestimate the past number of El Nino events by a wide margin and do a poor job of representing them and their impacts. Be advised. I once engaged you here at WUWT in a sincere an honest discussion and provided all the links and evidence you requested. Shortly thereafter on Slandering Sou’s site you denigrated me with several lies and misrepresentations of our interactions. You are not to be trusted. Your words are deceptive and misleading and I will never again wast my time responding to you. Changing the subject to distract from your own misconduct in this post is evasive and dishonest, Steele. By all means, keep digging. Be advised. I once engaged you here at WUWT in a sincere and honest discussion and provided all the links and evidence you requested. Shortly thereafter on Slandering Sou’s site you denigrated me with several lies and misrepresentations of our interactions. You are not to be trusted. Your words are deceptive and misleading and I will never again waste my time responding to you. Um, yup. Still over the target. Firstly. CandideSchmyles , well done for bringing this to the attention of the authorities. but it goes much deeper than that, my friend. The Illuminati lizard shape shifters have carelessly left a lot of clues in broad daylight which can be found by people like you and me who are prepared to look hard enough. The attack began on 21/9/13. 21+9+13 = 43. It’s 43 years since the beatles split up. The terrorists targeted the Chill Out Coffee Stop & Ice Cream Shop at Westgate Mall where many westerners were eating “99” ice creams. ” 99″ ice creams are made by Walls. Al Shabab were trying to start a revolution. “Revolution Number Nine” on the Beatles’ White Album lasts 8 minutes 15 seconds exactly … that’s 495 seconds … or 99 times 5! Ninety-nine and five – the number of victims of Jack the Ripper – the nickname of the Royal murderer and arch Freemason Albert Victor, Duke of Clarence, whose first victim was discovered in 1888 … on August 31st! Fast forward to August 31st 1997 … Lady Diana is killed when her Mercedes – driven by double agent Henri Paul – hits Pillar Thirteen in the Pont d’Alma Tunnel in Paris. Henri Paul? Sounds familiar? Get this! Actor Paul Henry plays an actor called Benny in the 70s soap Crossroads. The self-same McCartney who sang “Revolution Number Nine” on the White Album!, George Bush’s White House, the Whitechapel Murders and the Fiat Uno that forced Henri Paul’s Mercedes off the road! Track nine on the White Album is “Martha My Dear”. Cut to Martha’s Vineyard, USA … Ted Kennedy crashes his car into the water at Chappaquiddick on July 18th 1969 … the exact same day that Paul McCartney – Yes! Him again! produces the Mary Hopkins single “Pebble and the Man”, catalogue number Apple CT1! Apple CT1 was released as a promotion for Wall’s Ice Cream! The same ice-cream that’s in a Ninety-nine ice cream. “Ice cream” is an anagram of “ace crime”, like 911, the Whitechapel murders and the assassination of Lady Di in her Mercedes. Mercedes have hosted business seminars at the NEC International Conference Centre in Birmingham (where Crossroads was made) … as have … get ready for this … Cadbury’s!! Cadbury’s who make the chocolate flakes for 99s!!!Coincidence!? I don’t think so! Let’s look at the evidence … The Queen (who later knighted Paul McCartney for so-called services to music) opened the NEC Conference Centre on June 12th 1991! That date ring any bells? It should do – because George Bush Sr (former US president and long-time business associate of the Bin Laden family) had a birthday on June 12th 1991! 1991! It’s an anagram of 99 and 11, don’t you see? 99 divided by 11 is Nine! Nine-Eleven!! And what’s more, 1991 was George Bush’s 67th birthday! That’s what they what you to think, but just look at the figures! 67! 6 and 7! Six plus seven is 13 … Thirteen!!! The number of letters in “Osama Bin Laden”, “Paul McCartney”, “The White Album” and “Wall’s Ice Cream”!!! 13 is also the number of the pillar in the Pont d’Alma tunnel that Lady Di’s car crashed into!!! Well I see I’ve exceeded mod’s sense of humor. Mod: Looks like a [trimmed.] <—— I doubt the spam filter did that. Every single one of my posts has been going to moderation immediately for about a week. Fine with me, your site, your discretion. No worries mod. Toilet humor was introduced by Marcus upthread well prior to your shift. I’ll happily knock it off. I have to wonder why I comment on this site. Over the years I have had more mod-kills than successful postings, and yet every thread becomes a cesspit. It’s hard to argue that Don Quixote wasn’t a character of principle. Troll alert. Just ignore him and he will go away. I’ve always been partial to verses 3-5 myself, but find them even harder to follow than 6. Brandon, your ignorance of reality is…unprecedented !! The Sea Level Research Group, University of Colorado, seem to be finding a very strong 2014/15 El Niño. Jim: you live in a nice town! You may note that the apartments were built on SAND — Pleistocene dunes from the last Ice Age, most likely. Not too stable when the big winter waves come…. Pacifica is notorious for lax permitting of obviously bad building sites on the coast. Climate change or no. There are people still living in those apartments? Hard to believe. I wouldn’t sleep well. . .
Utter madness – it sent a chill down my spine – as an engineering geologist who has worked on slope stability I would be advising the responsible local authority to evacuate all those appartments urgently…. Only the North building appears to be occupied. Several residents could be seen, watching the breakers and waves, postponing their inevitable flight. Who can blame them for their fascination with the power of the sea? Home buyers have a simple choice..Do they want a home with a great ocean view or do they want a home that will still be there in 20 years ! When I wanted to buy a beach house on this stretch of coast, I looked at the fault maps and the cliff compositions. That immediately ruled out Pacifica. I bought down in Davenport, nearer Santa Cruz. Davenport has nice rock cliffs, and I purchased about a hundred yards back from the cliff. The following year was the ’98 El Niño, and I was watching the 50′ swells roll in from atop our rock cliffs, while a few houses in Pacifica fell off the sand cliffs. I couldn’t imagine why anyone would have bought there, and only later came to realize that the cliff had retreated many yards since they were built. It was still a poor place to put a house, but the original owners were probably long departed from this mortal coil. Someday my old place will suffer the same fate, if it’s still standing in a couple of centuries. Another excellent and eye-opening essay, Dr Steele. We are all the beneficiaries of your detailed knowledge of local environments, astute observations on the broader picture, and good writing. One nit: The plural of El Niño is El Niños, not El Niño’s, and similarly for La Niñas. Wonder how safe the large Lake Michigan pumped storage facility near the east coast of Lake Michigan is given the battering this coast has taken over the centuries? Once upon a time, before global warming, in the 1950s, there was a road that ran from John Daly Boulevard in Westlake to Palmetto Blvd in Pacifica. The road ran along the ocean cliffs. There is very little trace of it. Thanks for another very interesting post and a hike down memory cliffs :-). I used to live on the coast there in SF, Daly City, and Pacifica during the 60’s and 70’s. A good friend was killed at Devil’s slide when his car went off the road there due to a slip in the asphalt. These events have nothing to do with “climate change”, as you have pointed out.. Here are some historical photos and a report of one area I spent a lot of time at , just slightly north of Mussel Rock ,now called Avalon canyon (or Daisaku Ikeda canyon). I don’t think it even had a name back then, but at some point (70’s?) they built a new paved road to access some sort of storm drain that was installed in the canyon. In the 60’s, I used to hike down to the beach daily from my house just two blocks away , behind the “church” (then it was a Buddhist hall), to body surf and run my dogs. There was no “road” except for some fairly steep hiking paths. The only “road” there was a remnant of a highway ( I think at one time it was a part of Hwy 1) that had been taken out by a slide sometime earlier in the 20th century. It was a cool place in more ways than one. We used to say it was the foggiest place on earth , outdoing even London. Often would run into sea lions basking, and there was an abundance of other wildlife that lived there too. It was a great place to fossil hunt ! Who knew there were oceangoing hippos in California at one time? This link shows photos comparing the area from 1972 and 2013. Posting a link to another publication that shows a photo of the area from the 50’s, before many of the houses were built .The photo is around 2/3 of the way down (Westlake), sorry I couldn’t seem to just copy the picture. It shows the old highway too. The next link is a report of a slide in the same area that took place in 2003. It goes into great detail regarding the same geological factors that Dr. Steele has pointed out and there are some great photos in it too. Finally, I found a link to a video taken just last year by an intrepid bicyclist going down the “new” paved road into the canyon–note how the road has already slipped away in some areas. misbehave’ Thanks for the links. The paper on the Northridge Bluff Landslide is particularly informative. Do you miss the area? There are many things I miss about the area! So much history, natural and cultural, so many places to explore! So much to do! I used to keep horses in Pacifica during the 70’s at what came to be called Coastside Corral (used to be Saddle Town before Pacifica became built up). At that time it seemed like one could ride as far as one wanted to in most directions. They had already started paving over most of the bridle paths in SF for joggers and bicyclists. Used to love to go to the tidepools at Moss Beach (took my kids there too after they came along). Don’t miss the damp, foggy , windy, cold though! The ocean water there gets downright frigid! I took a thermometer in with me one time because I’d always turn blue when body surfing (sans wetsuit) –it was 38F. Of course where I live now, summer days are often over 100F-that isn’t much fun either LOL. Sorry to go off topic, but as far as urban areas go, there is no place I like more than SF + surrounding peninsular areas. The scientific and historical material is great. I actually visited the touristy lookout at Seal Rocks in 1963. That is as close to Pacifica as I am likely to get. Thus, can’t add to the topic. You mentioned the tunnel. I used Google Earth and its series of photos to see when and how the 2 ends developed as it was constructed. The focus is bad on some of them but, still, viewing that and the old road is interesting. I now live in Washington State. WA has its own coastal issues such that one place is called Washaway Beach. Washaway Beach is, well, washing away. Google Earth will locate Washaway Beach, WA for you. A couple of years ago the erosion took a few houses and so was much in the news, but this has been an on-going problem for many years. The name is not new. A lady named Erika Langley lives nearby and has a nice photo gallery, in this case called “Tides-A-Com’n”. Sounds like now is the time to wander the beaches there looking for jade! Nothing whatsoever to do with the mile-wide gouge zone that marks a major tectonic plate boundary, combined with 9000 km of marine fetch. Nothing at all. I once went surfing with a business associate at Leucadia. Interesting to walk down the path to the beach observing the water trickling down through the sandstone, keeping everything lubricated. Also interesting, the houses on the seaward side of the road. I was told that they could only insure the part of the house near the road as it was only a matter of time before the rest disappeared into the ocean. Trivium 1 — What does “, bd6951,” mean in the first or second ‘graf? Trivium 2 — if you want to understand what sea walls do, get some maps of the southern California coastling from Seal Beach to Point Firmin from the 1940s (pre gorebal warmening–ice age was the worry then) and compare with today. Malibu is interesting but I don’t San Pedro Harbor had anything to do with that. Proves why we SHOULDN’T care about Da Sea Level Rise hysteria. Virtually every “coastal” property actually sits tens of metres ABOVE the coast. They will drop into the sea by erosion millions of years before seas rise enough to worry them. It’s most obvious in northern NSW, where old council street maps extend several blocks into the ocean. Many thanks for an excellent article Jim. Always a good read. Two major oceans responsible for global climate variability are N. Atlantic and Pacific (Pacific being subject of this thread). Pacific Ocean is mainly on the Pacific tectonic plate, while one half of N. Atlantic is on the Eurasian and the other on the N. American plate. Secular geomagnetic changes (including spectral composition) on the multidecadal time scale are thought to be a good proxy for movements in the Earth’s crust and the mantle further down. –	for the N. American plate – the principal ~60 year AMO periodicity is the most prominent, major part of the Gulf stream and subpolar gyre is to the west of the MAR. Surprisingly 22 years (solar magnetic periodicity) is almost as strong. –	for the Pacific plate there are two peaks at 40 and 48 year, well out of range of the N. American’s plate spectrum. I am less familiar with the Pacific indices spectral composition, although I think the PDO primary component (according to the UCAR) is at around 50 years. –	Euroasian plate contains components which appear to be result of the cross-modulation of the above, the most prominent being at ~36 years. But have no influence on the climate. I did think it wouldn’t be long before we meet again. I didn’t say it did, but the movements in the Earth’s crust and the mantle further down might (tectonics). Why is there very distinct 22 year component in the N. American plate, very small one (noise level) in the Euroasian and none in the Pacific plate? Perhaps because the 22 year is associated only with the postglacial isostatic uplift, but only small part of Euroasian and almost none (if any) of the Pacific plate were under ice sheet see image . Further observation: N. American plate is flexing at 22 year periodicity only in its northern parts, despite the fact that the areas north of Florida may be sinking, oscillations diminish to the ‘noise’ level. What about this climate thing you mentioned? Ah , yes, the old devil ‘22 year’ periodicity is there (no 11 years though, as Mr. W.E. has shown on number of occasions). but the movements in the Earth’s crust and the mantle further down might (tectonics). And if pigs had wings they might be able to fly. There is no evidence that any of your claims are causal rather than just coincidental. Your new meme “progressive thinking scientist’ is completely misplaced and might be replaced by ‘uncritically believing pseudo-scientist’. I think you are hurting the credibility of WUWT trying to drag it down to the low level of Tallbloke’s talkshop that may be more fitting for your musings. I use the best data available. I said it might, you say it doesn’t. I follow the rules of the blog, and it will engage only on subject of science, settled or not. That is the end of conversation as far as I am concerned. I am aware that Dr. Svalgaard is an expert on solar physics but nevertheless that is a bold statement! Have secular geomagnetic changes ever been investigated for possible effects (either directly or indirectly) on climate? Until they have, and are found wanting, Dr. lsvalgaard’s posit remains just that and, athough it comes from a leading scintist, it has no validity, scientific or otherwise. If they have been investigated, please refer me to the paper(s) proving that climate is unaffected by secular geomagnetic changes. Who has that much time? Again, Prolific wordiness from BG. Does this guy even have a day job? Plate tectonics will win. There will be a double peninsula at some point. The Palmer Drought Severity Index shows drought severity from regional waterfall, soil moisture content, streamflow (and other sources) in surveys going back as far as 1910. What’s clear from a quick scan of years, since the ’30’s for example, is the oscillation between years of drought to years of moisture, shown in standard color-coding of red-purple-brown for “extreme” or “severe” drought years to yellow-light-green-green for years of heavy to extreme moisture. The oscillation appears across our continent as more patchwork than clockwork, and doesn’t particularly coincide with El Ninos / La Ninas that I can see, but about 14 “cycles” (if I may call it that) have occurred since the year 1930. Moist years are particularly evident in some spans when the U.S. is all-green-and yellow for many months on end. These inevitably transition back into periods of low-precipitation, such as the West has endured in the last four or so years. Here’s North America in December of 2015 with California’s drought reflected in red. interesting essay by Jim Steele. Stopped reading when that solar cycles, solar magnetism noise restarted.